That Have Helped Junior to Collegiate Players Win! Learn how to boost your mental game of tennis and develop the confidence of a champion quickly and effortlessly with tennis psychology mental game coaches, Dr. Patrick Cohn and Dr. Megan Melchiorre! If you’re not performing up to your potential in matches, most likely your mental game is holding you back. Are you so frustrated with your performance you feel like giving up? Does your confidence evaporate when you play in tournaments? Are you tired of working hard in practice and not getting any results in matches? Dr. Cohn and Dr. Megan can help you uncover the beliefs and attitudes that keep you from performing to your potential. 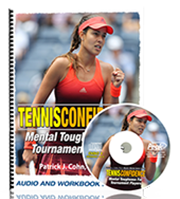 You’ll learn proven mental strategies they teach to help nationally-ranked Junior tennis players get into the winner’s circle (see what players are saying below). Dr. Cohn has helped 1000s of athletes over the past 25 years to improve their mental toughness and get the mental edge. Dr. Cohn earned a Ph.D. in Sports Psychology from the University of Virginia. He’s the author of the popular Tennis Confidence: Mental Toughness for Tournament Players Workbook and CD Program and The Confident Athlete CD Series. He also created the Mental Game Coaching Professional Certification. You can improve your mind game for tennis with one-on-one with Dr. Cohn himself in Orlando, Florida or get coaching from anywhere in the world via telephone, Skype, or video conferencing. All tennis programs include the Athlete’s Mental Aptitude Assessment (AMAP), a custom mental game plan, weekly coaching sessions, unlimited email correspondence, and the Tennis Confidence CD and Workbook program. One-on-one mental coaching is the fastest and most effective method to improve your mental game, boost your performance, and make lasting changes. We have a variety of mental coaching programs to choose from. Please review the options below and call us at 888-742-7225 with your questions. The Gold Program is our premium onsite package, which gives you the benefit of spending a full 8-hour day (or two half days) with Dr. Cohn himself. This programs also includes four sessions per month of additional coaching (for one to six months). 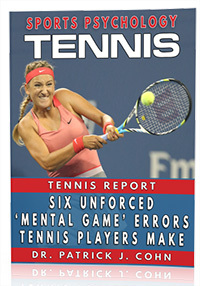 Tennis Players’ Mental Aptitude Assessment (TMAP) to identify mental game challenges. Custom Mental Game Plan, which guides your mental game improvement. Eight-hour onsite visit with Dr. Cohn himself to kick start your program. On court lesson on service, return of service, and change over routines. Four sessions of additional coaching per month to improve mental toughness and stay committed to your Mental Game Plan (45-minute sessions). Unlimited email correspondence with Dr. Cohn to answer any immediate questions. 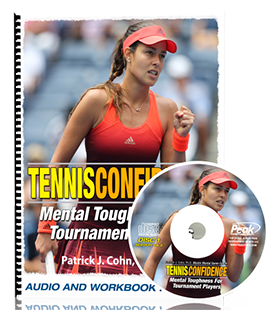 Tennis Confidence: Mental Toughness for Tournament Players CD and Workbook program to help you review and apply mental game strategies between sessions ($299 value). The Silver program allows you to work one-on-one with Dr. Cohn in person (Orlando) or anywhere in the world via Skype, telephone, or video conferencing. Whether you’re at home or traveling for competition, get the mental edge over your competitors. This program includes four weekly sessions per month (for one to six months). Four weekly coaching sessions per month (45-minute sessions). Start a Mental Game of Tennis Program Today! Please contact us today to learn how mental coaching works and to request pricing on all mental training programs for tennis players. Complete the web form below to contact us via email or call us toll-free at 888-742-7225. Input your name, email, and role below.